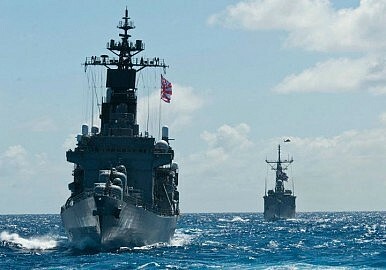 Drama in the East China Sea between Tokyo and Beijing has gone from bad to worse. On Tuesday, Japan's Defense Ministry reported that a Chinese frigate "illuminated" a Japanese destroyer with its fire-control radar near the embattled Senkaku/Diaoyu Islands. Lighting up an adversary ship or aircraft designates it as a target for missiles or guns, and thus constitutes a prelude to firing on that adversary. The latest incident came after Tokyo publicly contemplated empowering Air Self-Defense Force pilots to fire warning shots in the vicinity of Chinese aircraft overflying the islets or adjoining waters. Which came on the heels of repeated encounters between the Japan Coast Guard and ships from China's maritime enforcement services. Tokyo also disclosed that a Chinese frigate illuminated one of its helicopters last month. The back-and-forth between the rival sea powers will feel at once familiar and unfamiliar to any mariner of a certain, ahem, vintage. The U.S. Navy and Soviet Navy played more than their share of hair-raising games during the Cold War — particularly in the 1970s and 1980s, once Fleet Admiral Sergei Gorshkov's progeny had matured into a peer competitor of the American fleet. It was far from unusual for U.S. and Soviet warplanes, surface combatants, and especially submarines to target or maneuver around one another at close quarters. There were a variety of reasons for doing so that had little to do with indulging one's inner Maverick and Goose. For instance, goading an opponent into taking defensive measures revealed something about the tactics he would deploy in wartime. Such encounters also furnished an invaluable opportunity to collect information about the rival navy's sensors, electronic countermeasures, and weaponry. Electromagnetic emissions can be recorded and analyzed, with a view toward exposing and exploiting weaknesses. Tactical advantages can accrue. And yet the run-ins between JSDF and PLA units feel different from their Cold War predecessors. There was a certain amount of flexibility in U.S.-Soviet brinksmanship, if only because the two sides were playing with each other for tactical reasons rather than competing over fixed geographic objects on the map. There was less to fire passions. Ideological one-upsmanship was commonplace. Being a provocateur was fun. But sovereignty — an arena for Thucydidean motives like fear and honor — wasn't at stake when American and Soviet units met in the nautical commons. Even so, enough near misses took place that Washington and Moscow ultimately felt obliged to negotiate an accord governing incidents at sea. One hopes warriors on both sides — and their political masters — will exercise discipline in the East China Sea. A deliberate conflict would be bad enough. An inadvertent one that heightened uncertainty, narrowed options, and compressed the decision cycles in Tokyo and Beijing would prove even more parlous. With Chinese aircraft flying near disputed islands, Beijing seems to be employing a familiar strategy.